This is just a quick and dirty update on what I’m currently working on. I have just sent out some map art to be prototype printed and while I wait for those I’m working on a countersheet. The counters will be 5/8 inch double sided cardboard counters, 176 in total. Lots of fiddling in PhotoShop I can tell you. The counters will all have black backgrounds I promise. The garish colors in the image is just borders for image bleed and safe areas, they won’t be on the countersheet itself. Well, that is it I guess. And then Han Solo proceed to go head to head against a Star destroyer, barely avoids crashing into the bridge and then miraculously vanishes from the Star destroyers sensors and is gone. The Star destroyer has lost them and captain Needa suffers a reprimand while Millenium Falcon has secretly docked to the enemy ship. Sure, Star Wars is space fantasy and the ships certainly doesn’t follow the laws of physics or even common sense but let’s find out if this particular daring maneuver is at all possible using the Intercept rules? We will only use the standard rules here, no house rules or Star Wars conversions, just plain ol’ Intercept. Han, Leia and Chewie hastily exit the asteroid to avoid being eaten by a huge improbable worm. A nearby Star destroyer detects them and give chase. Falcon first seem to shrug of the fire from the enemy but then a hit destroys their rear deflector shield. Han reroutes all power to the forward deflector shield, turns around and fly straight at the enemy. Captain Piett order shields up as Falcon barely misses them. The Star destroyer has lost track of the Falcon and assume it has escaped, possibly through some sort of cloaking device albeit a ship that small is unlikely to have one. Falcon has in fact docked on the rear side of the Star destroyers bridge tower. The Azhanti has lots of weaponry including the deadly meson spinal mount. Darth Vader wants to capture the ship rather than killing it as he believes Luke is on board. The Azhanti will use its two batteries of 10 MW lasers each and its two batteries of 50 MW each. The Azhanti will also use Spray fire attacks to trade damage for multiple hits hoping to cripple rather than killing, most commanders know what awaits if one displeases Darth Vader. We will simply assume that Han Solo with his excellent piloting skills and a target number of 7 will always be able to turn at least 4 steps (which is the same as saying he will roll 3+ on his Pilot task rolls). We also assume that the cruiser will use many of its computer pool dice to get 2 steps of turning on every turn. Given the fact that when Han Solo initially escaped from Hoth and was chased into the asteroid belt his fancy flying had two cruisers nearly crashing. Surely lord Vader will have none of that so the cruiser captains make damned sure that maneuvering is a top priority. 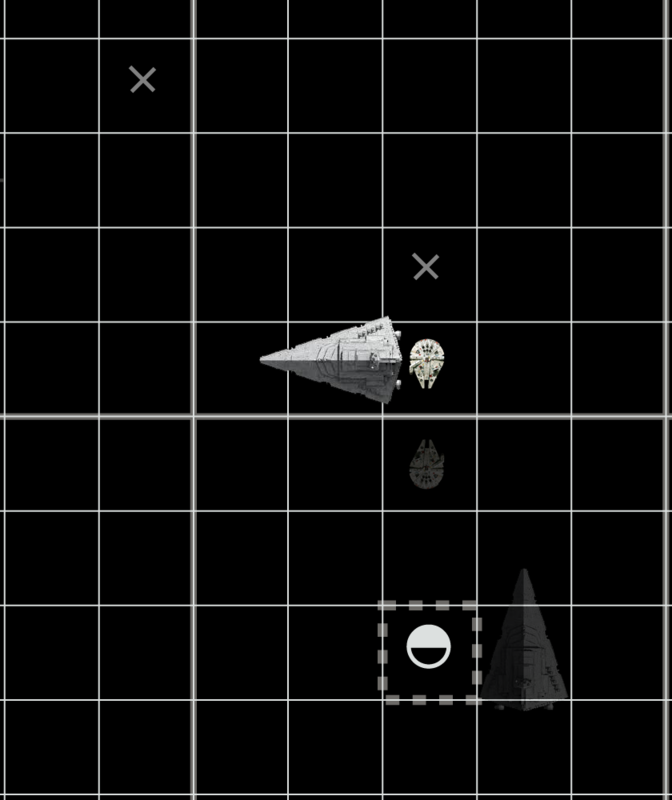 The trader is leaving the asteroid with a speed of 2 and the Azhanti has the same speed, two squares behind and one to the right. The cruiser immediately give chase and the fight is on. The cruiser fires its lasers at the trader and the trader defends using the two sandcasters of its belly turret. The sandcasters does not completely stop the laser attack and the cruiser inflicts Severe damage to the Surface location of the trader. The cruiser know the trader is now nearly defenseless and confidently turn and thrust to close the gap. The trader captain knows he can no longer rely on the sandcasters fending off the cruisers lasers and he cannot outrun the cruiser as the trader’s 1.8 Gs is no match against the 2.3 Gs of the cruiser. He decides to turn the ship around and go for the cruiser’s blind aft centerline. C3PO shouts in protest and Needa flinches as the trader passes the bridge of the cruiser. The trader disappear from the cruiser’s sensors as it has moved into its blind aft centerline. The next turn the cruiser will no longer learn the trader’s move. It is crucial that the cruiser reacquires the trader or the trader might slip away. Failure is not an option when Darth Vader is your commander. 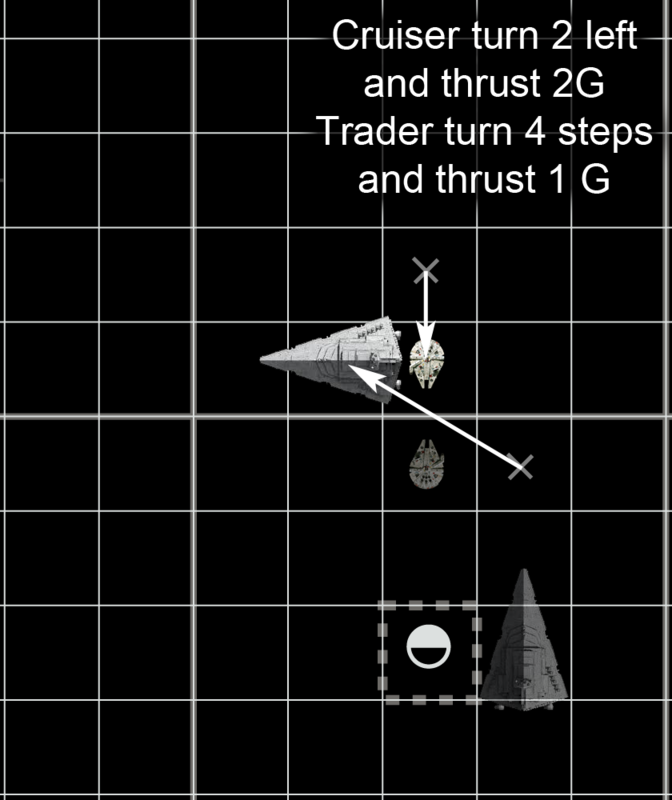 The captain uses the formidable computer power at hand to turn the cruiser 2 left and thrusts for 2G, turning the cruisers blind aft centerline away from where he thinks the trader will go. The trader decides to capitalize on the cruiser being blind by turning towards the cruiser and thrusts to get on top of it. What is Han Solo thinking, surely the cruiser will have the common sense of scanning itself when the enemy has lost its track? The movement phase is over and its time for the Sensor phase. Having lost the track of the trader the cruiser should perhaps go for a wide scan that is guaranteed to contain the trader, a Visual or Infrared 2×2 box Scan maybe? Every sensor operator and every officer at the naval academy learns that Scans touching the Sunglare column are bad, akin to staring into the sun on guard duty. Sure, Hoth lies outside of the Goldilock zone of its star and the asteroid belt is even further out it will still severely degrade the Scan, what else to do? The best option might be for the commander to put a small 3×3 square Radar scan on the ship. Radar don’t suffer Sunglare degrading and will make sure the trader cannot hide anywhere near the ship. We who have seen the movie knows this is not what happened – Leia and Han was not captured and brought to Vader’s command ship so why didn’t captain Needa use a radar scan to reacquire the trader? The reason is simple; as Needa has left to ‘apologize’ to Vader the remaining bridge crew on the cruiser does not want to signal to Vader that they have lost track of the prey. Vader’s command ship will surely pick up the radar scan of the cruiser and inform lord Vader of their incompetence. 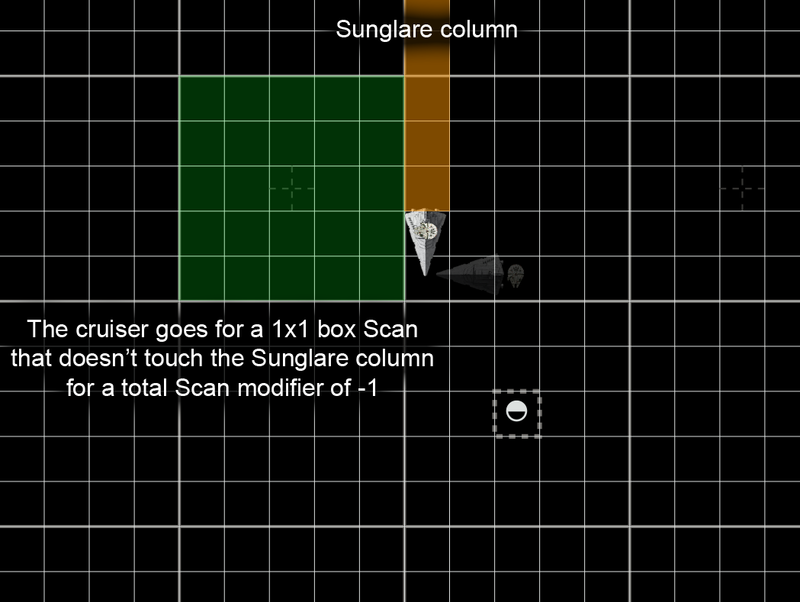 The cruiser decides on a Visual 1×1 box scan that doesn’t touch the Sunglare and covers the presumed location of the trader. The cruiser sees nothing and it’s remaining bridge crew learn the fate of captain Needa, failure is not an option in tbe Imperial navy it seems. It is time for the next turn. Finding nothing from the previous turn’s Scan the cruiser turns left and thrusts for 1G. 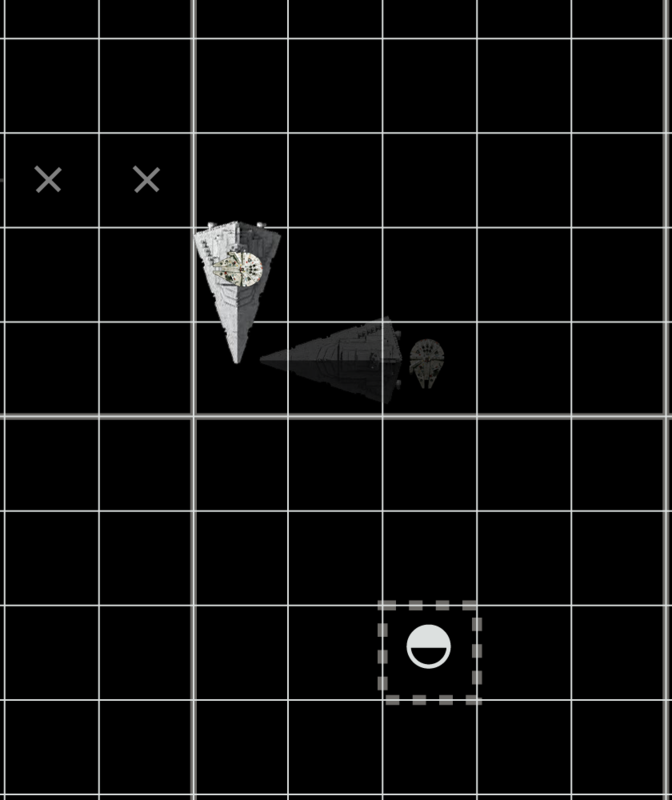 Han Solo, still untracked, executes the final step in his clever gamble and manuvers to dock with the cruiser (same, position, vector and facing is all that is required). The trader is now docked with the cruiser and the only way a Scan to detect it is if the scanner explicitly states that they are scanning for docked ships, with their Sense target number up to 7+ from the usual 6+. See page 26 of the rulebook for details on Landed or docked. The trader ship will remain docked until the fleet get ready to jump. Very few people have ever heard about this trick; to dock unseen with an enemy vessel to elude detection, unfortunately for Han Solo, one of these few is Boba Fett who follow them as they undock. So, there you have it: playing out the escape from the Hoth system using only standard Intercept rules, even finding rationales as to why captain Needa does what he does. Keep space tidy – dump in jump. What is this Marre-red maneuver Sir? It was invented by a rather colourful pirate called Mauricius Redondo way back and is used when you come out of the sun and assume your enemy is hiding in the planetary shadow. You approach the planet building up quite some speed, say 30 to 50 klicks a second, and drift as you pass above or below the planet with your powerplant off. Keep drifting ’til you think you passed the enemy the power up the reactor and start braking. You are now ‘south’ of your opponent, in the planet shadow with your enemy to sun-ward yet no risk of any sun-blinding. Then you take him out son. Sensors part 1 skipped the rules on how planets and asteroids may affect scans, this post is going to remedy that, first with the actual rules and then some examples on how this work in practice. The following blog posts deal with the the different sensor types and how to avoid being detected by them. Planets block line of sight, it’s quite obvious; just look down at the ground at night and notice that you cannot see any stars. Ships far from a planet cannot see targets on the opposite side of the planet if they are near the planet. Ships near a planet cannot see targets on the opposite side of the planet, regardless of how far they are, and ships scanning for targets near a planet cannot see targets if they are opposite the planet regardless of how far away they are. Planets cast long shadows where ships can hide. 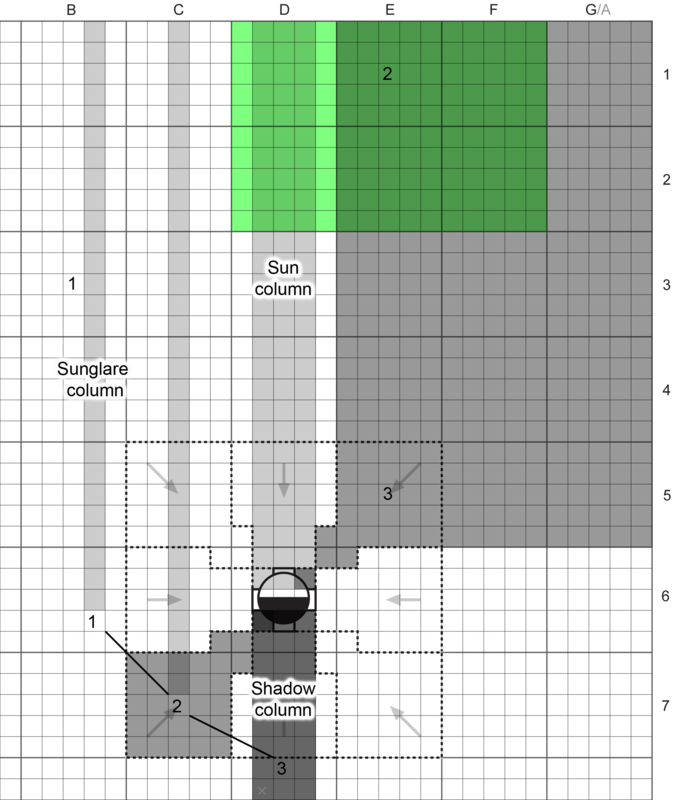 The column below a planet, 1 square wide for Small planets, 3 squares wide for Large planets, is called the Shadow column. 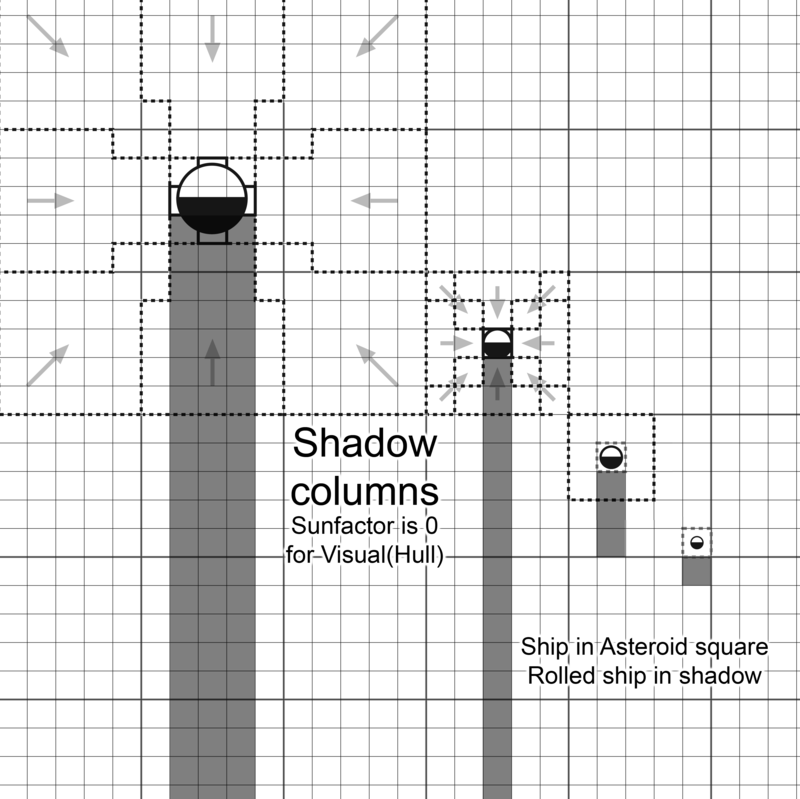 Ships and missiles in the Shadow column treat the Sunfactor as 0 instead of its normal value (usually 6), no other signatures are affected by planetary shadows. Ships in shadow also ignore Sunglare. Planets also block Line Of Sight (LOS) of course, ships on one side of the planet won’t see and won’t be seen by ships on the other side. Planets have sectors that delineate who can see whom, near sectors that are simply the 8 arcs of the gravity well, and far sectors that extend the gravity arc all the way out to the edge of the map. 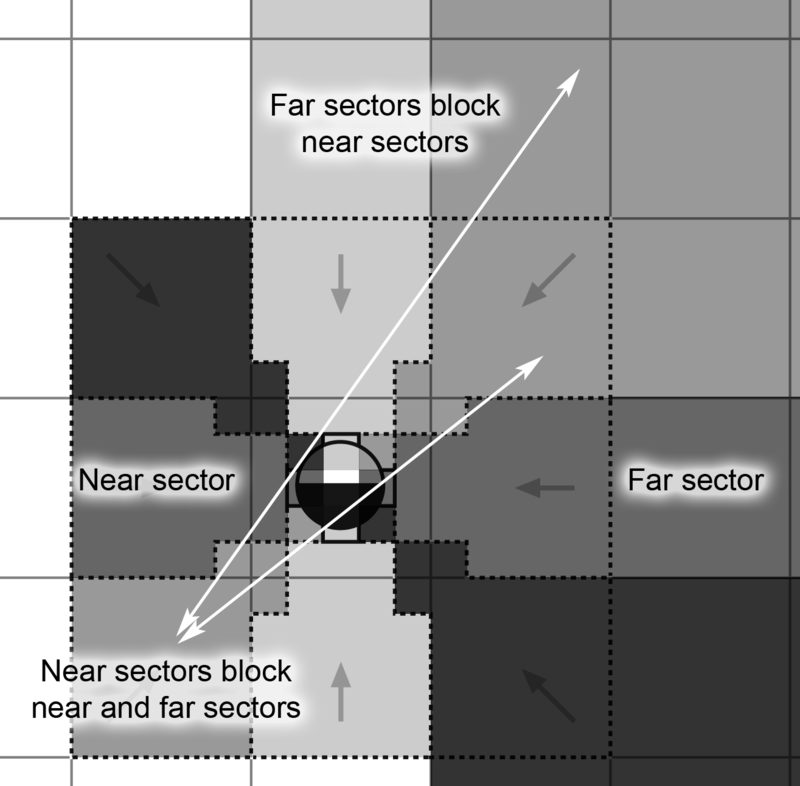 If your ship is inside a gravity well the opposite near & far sector are blocked. If your ship is outside of the gravity well but your scan touches the gravity well the opposite near sector is blocked. Planet LOS is symmetric so a ship cannot see a someone that cannot also seem them. Look at the pictures for the near and far sectors of planets, small and large. So, how does this work in practice? The scanner has placed a Scan somewhere and it’s up to the target, to make sure it is a legit Scan. This is done by the target asking the scanner a few simple questions and act upon the answers. Does the Scan touch your ships Sunglare? 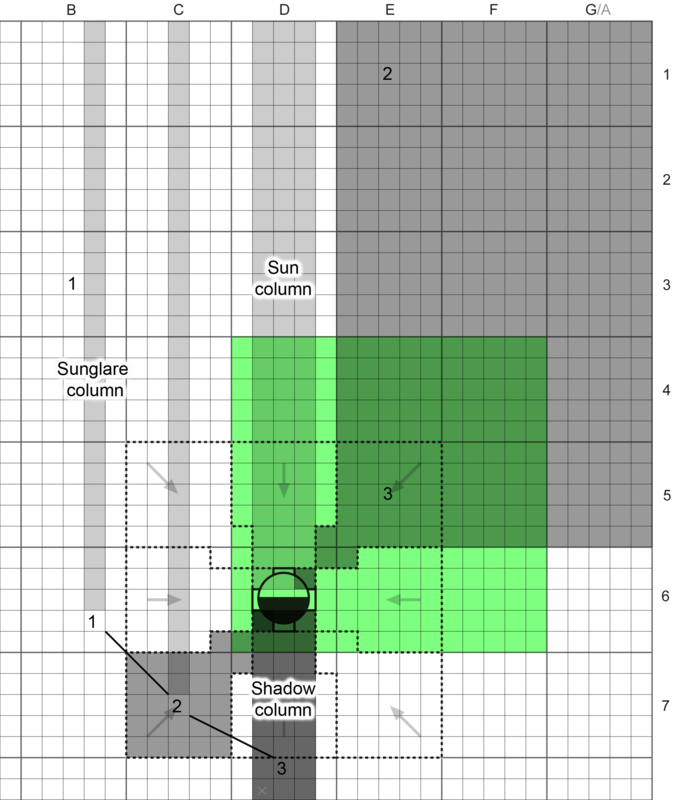 If the scan touches your Sunglare column and you are not in shadow you say yes and reduce the scan strength of your scan by Sunfactor (typically 6). 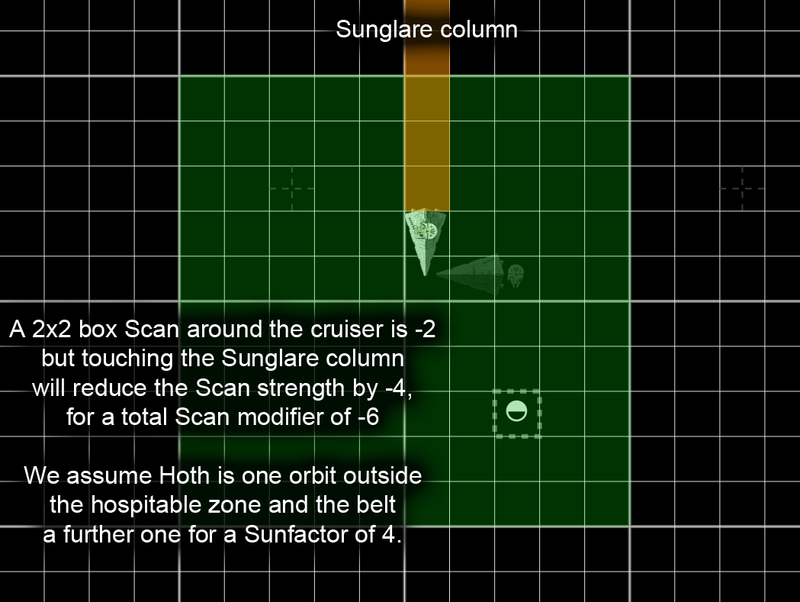 If the scan does not touch your Sunglare column or your ship is in shadow you answer no and leave the scan as it was. This question is always asked. 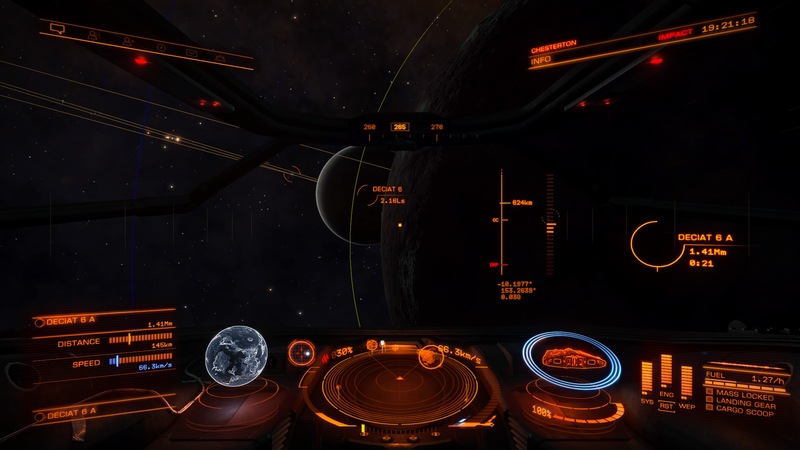 Does a planet block parts of your Scan? Your opponent now asks you if the planet blocks part of your scan. 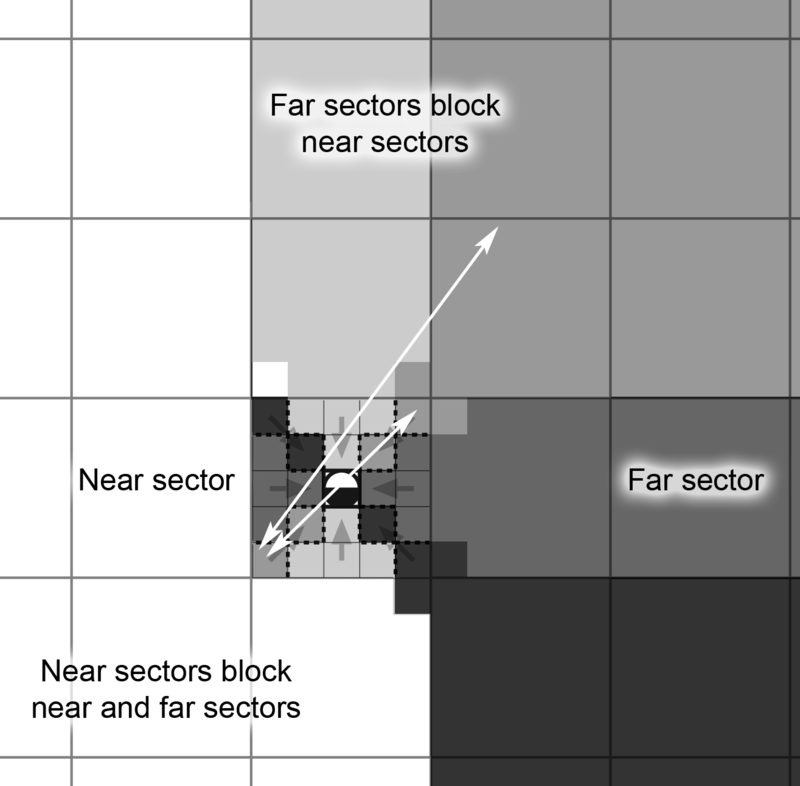 If your ship is inside the gravity well (a near sector) the opposite near and far sectors are blocked. If your scan touches any of the blocked sectors you must tell your opponent what is blocked of the scan, if your scan doesn’t touch the blocked sectors you tell him nothing. If your ship is in a far sector the opposite near sector only is blocked. If your scan touches that blocked sector you must tell your opponent what is blocked, if your scan doesn’t touch the sector you tell him nothing. The scanner simply places his Scan somewhere calculates its strength based on Sensor + Scan modifiers. The target of the Scan then ask a series of questions which may lower the Scan or make certain parts of it ignored. Scans are done in reverse Initiative order. The scanner grudgingly admits that the Scan does touch his Sunglare column so the target reduce his Scan strength by -6 to an abysmal -5. If the target was not inside the Scan he would say Nothing, if inside the Scan but with a Signal of -1 the target would still say Nothing, if the Signal was 0+ it would be a Contact so the target would tell its position and what Signature(s) that gave 0+ Signal, the scanner would then probably do a Sense task to try to get a Tracked result on the target. The target player has also learned that the scanner’s ship is somewhere below the Scan, thank’s to the Sunglare. Player A has moved his ship into position 2 and decide to do a huge 3×3 box scan centered around E1. The scan modifier for a 3×3 scan is -3 so his with his +2 Sensor the Scan strength is -1. The scan touches the Sunglare column but as the ship is in shadows the answer is no. The near north sector will be ignored but most of the Scan is still valid as you can see. Had his scanning ship been 3 squares to the right none of the Scan would be blocked,had the ship been one square further up it would be in the near sector (gravity well) so the entire opposite arc would be blocked, all the way to the top of the map. Asteroids cast shadows so you can reduce your Visual(Hull) by staying in their shadows and by staying in their shadows you may also ignore Sunglare. Asteroids are too small to offer Planet LOS blocking however but there is still a way to get LOS blocking from an asteroid; land on them. See page 26 in the rulebook. There is this obscure trick where a ship with the same position, vector and facing of a larger ship lies in its shadow so it treats the Sunfactor as 0. 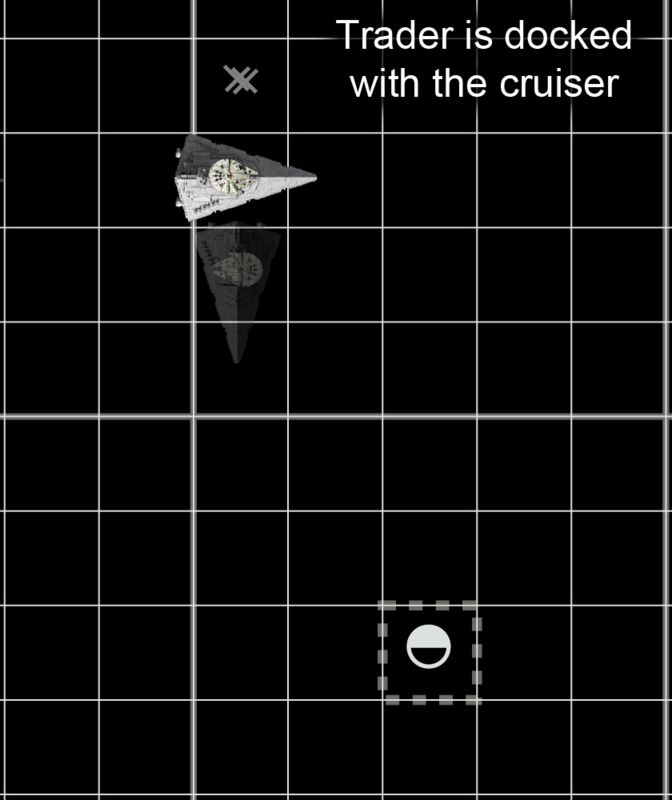 This is called shadowing and and can be done with friendly ships as well as enemies. Sunglare does still apply when being in shadows this way however. Shadowing enemy vessels is a good way to stay undetected as ships rarely scan their own position. Be cool and stay in the shadows until next time, over and out. Knowing the sensor rules well will probably win you more battles than any other part of these rules, it is also what sets Intercept apart from other space combat games as it allows double-blind movement without a referee. 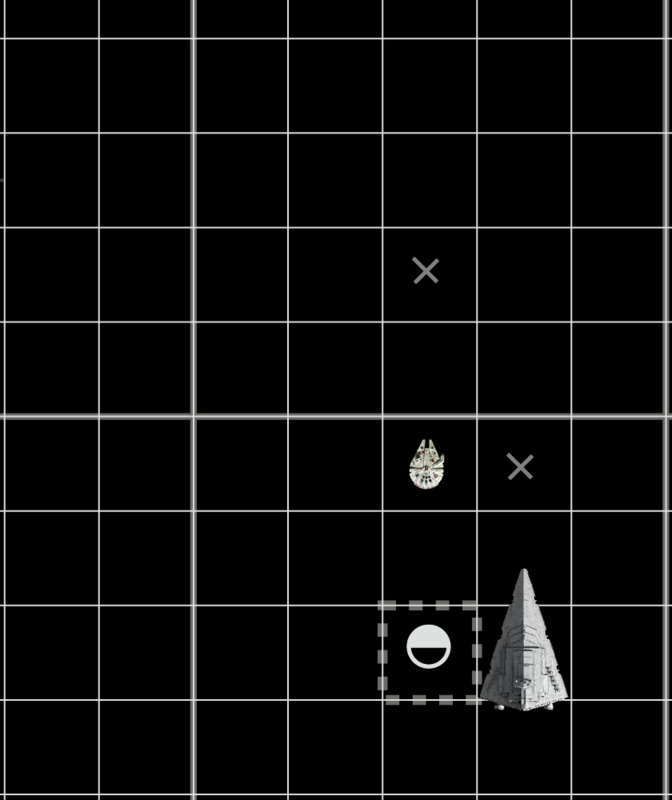 Using sensors resembles the old game Battleship; choose an area on the map to scan and if an enemy have targets there they may become detected. Larger scans mean lower sensitivity so if you search too large an area the enemy may go undetected despite being inside the area you scanned. Scans The scanner decides on up to two areas to scan and determine the scan strength of each, this is revealed to the target. Questions The target ask questions about the scans that may reduce scan strength or ignore parts of the scans. Signal The target determine the signal by adding his ships signature to the scan strength for each ship or missile volley inside the scan area. Target reveal any signals (signature + scan strength) that are 0 or higher. Sense roll If the scan got at least one signal that was 0 or better the scanner may roll a Sense task trying you get a Tracked result on the target. Only one Sense roll is done and is used for all 0+ signals. Sensor scans are done one side at a time in A / B order, each side is allowed up to two scans. A / B order means that side A scans first on odd turns and B on even turns. 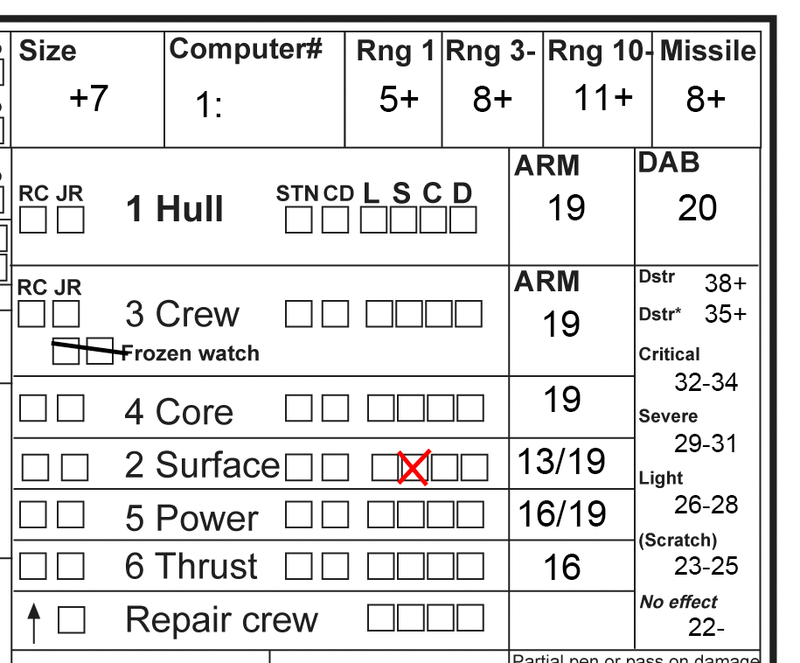 There is a row of boxes at the bottom of the mapsheet, cross them off as each turn is performed. The leftmost uncrossed box tell you if it is an A or B turn (A means player A win Initiative ties and scans first, B means the same for player B). The procedure is similar to the game Battleships, the scanner selects an area to scan and the opposing player, the target, reveal what’s there if anything. It’s a bit more complicated than that of course but it’s basically the same. The scanner decide on a square area on the map, from a single square to 5 by 5 boxes (25 x 25 squares) covering most of a map. The area does not have to be all on the map and it doesn’t matter if the scan includes planets or asteroids, at least not yet. Tell the opponent what scan type (Visual, IR, Radar, Neutrino or Mass), and the area of your scan (top left and bottom right corners) and show on the common map. Determine the scan strength by adding your sensors strength with the scan size modifier. 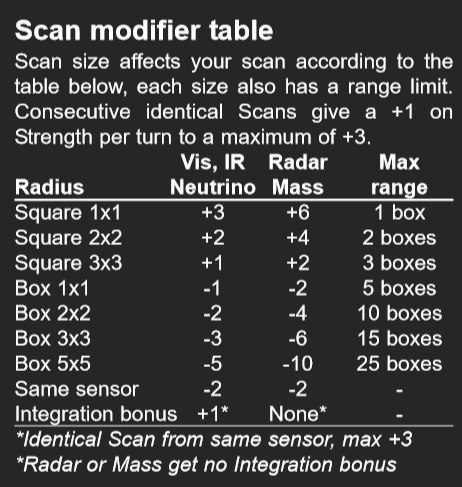 Note that radar and mass scan use different scan size modifiers. Tell your opponent, the target the strength of your scan. Note that a smaller scan area gives a higher scan strength and thus a greater likelihood of detecting whatever is inside the scan area while a larger scan area and thus a lower strength will be more likely to have something inside them. Each scan size has a maximum range which the entire scan must lie inside, larger scans have larger maximum ranges, maximum range is always five times the scan size. A 3×3 square scan has a max range of 15 squares or 3 boxes, a 2×2 box scan (10 by 10 squares) has a range of 50 squares or 10 boxes and so forth. All parts of the scan must be within 5 times the size of the scan. After the scanner has declared both of his scans it is time for the target to handle the scans, one at a time. The target will ask a couple of questions that may reduce the strength of the scan or have parts of the scan area invalid. If the ship is in sunshine and your scan touches a one square thick column extending from the square just above your ship all the way towards the sun. If that is the case you answer yes and the scan strength is reduced by the Sunfactor, typically 6 is subtracted. This is the detrimental effect of your sensor looking directly at the sun. Do not answer yes if the scan is radar or mass or if your ship is in planetary shadow (ships are never considered in planetary shadow against neutrino scans). Note that the Sunglare column does not contain your ship itself, only the column above it all the way to the top edge of the map. Radar and mass scans ignore Sunglare questions, skip this question when using them. There are more questions to be asked by the target to the scanner if the map has planets or asteroids on it but it will do for now. 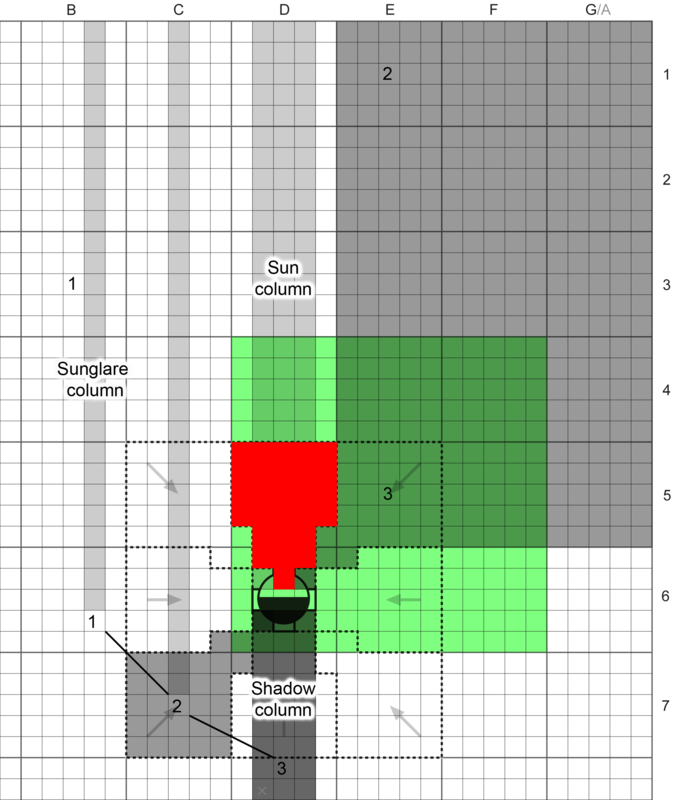 Sensor rules part 2 will handle Sun/Shadow columns and planet LOS in detail. Signal is what you actually end up seeing on your screens; Nothing, Contact position or a fully Tracked target good enough to shoot at. Normally you perform a Sense roll to determine what you get but if the Signal is 12 or higher you automatically get a Tracked result, no Sense roll is needed for that. Nothing Signal of -1 or lower. The target don’t tell you anything at all, not even if anything was there or not, nothing is nothing. Contact Signal of 0-11. Target tells you all 0+ Signatures; the Signature value and the type, Visual(Hull) or Visual(Thrust) for Visual scan for example. Roll a Sense task to determine if you got a Tracked result. Tracked means the target tell you everything about its ship, its position, vector, facing, if it has rolled etc. 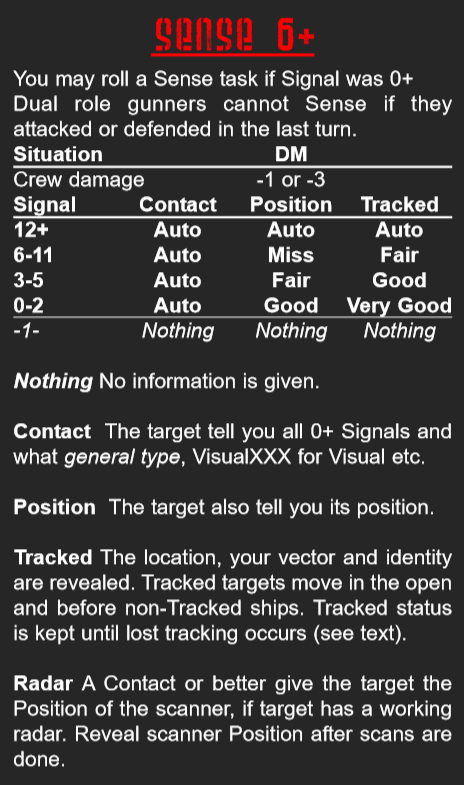 Target also tell you damage status, and all capabilities of the ship, basically everything on the datacard. Tracked ships move in the open on the common map before any untracked ships. Tracked status remain from turn to turn with no need for new Scans. Tracked ships launching missiles or ships will have them tracked too. If the target tell you that you got a 0+ Signal the scan has given you something, you know something is there and all Signature(s) that gave 0+ Signal. Roll a Sense task to try to get a Position or a Tracked result. Popped in loses all tracked targets* and all launched missiles. Target beyond max range as given by the Max tracked table in the rulebook. The following blog posts deal with the the different sensor types and how to avoid being detected by them. It was invented by a rather colourful pirate named Mauricio Redondo way back and is used when you come out of the sun and assume your enemy is hiding in the planetary shadow. You approach the planet building up quite some speed, say 30 to 50 clicks a second, and drift as you pass above or below the planet with your powerplant off. Keep drifting ’til you think you passed the enemy then power up the reactor and start braking hard. You are now ‘south’ of your opponent facing him, in the planet shadow with your enemy to sun-ward yet no risk of any sun-blinding. Then you take him out son. Intercept comes with a bunch of ready-made maps, empty, with a small or large planet or our beloved Earth and Luna system. Aside from the grid squares and boxes there are some features that might not be that obvious. This little post will teach you what they are and how to use them. Oh, and if anyone want a custom map with planets and asteroids give me a message here on the blog and I’ll add them. The Intercept map consist of individual squares and larger boxes, each box holding five by five squares, each box has a column letter and a row number to help identify which box you mean, individual squares within a box are numbered left to right and then top to bottom. The top left square of the top left box is A1-1-1 for example and the top right square of the third box on the second row of boxes is C3-5-1. The top left box of each mapsheet has the columns and rows numbered for you. Note that the rightmost column of boxes is labeled G/A and the lowest two rows are labeled 10/1 and 11/2. If you wish to play on an area larger than a single mapsheet the rightmost column form the first column of the next sheet and the lower two rows for m the first and second of the sheet below. This overlap is there to simplify maneuvering straddling the two sheets. Note that playing on more than one sheet complicates the game quite a bit so don’t do it unless you feel like it is really needed. Simply stating that ships flying outside the sheet are lost works fine too and is much simpler. The box G/A 10/1 also has the columns and rows numbered for you, this is to help you remember that this box might be the top left box of the next sheet to the right and down. 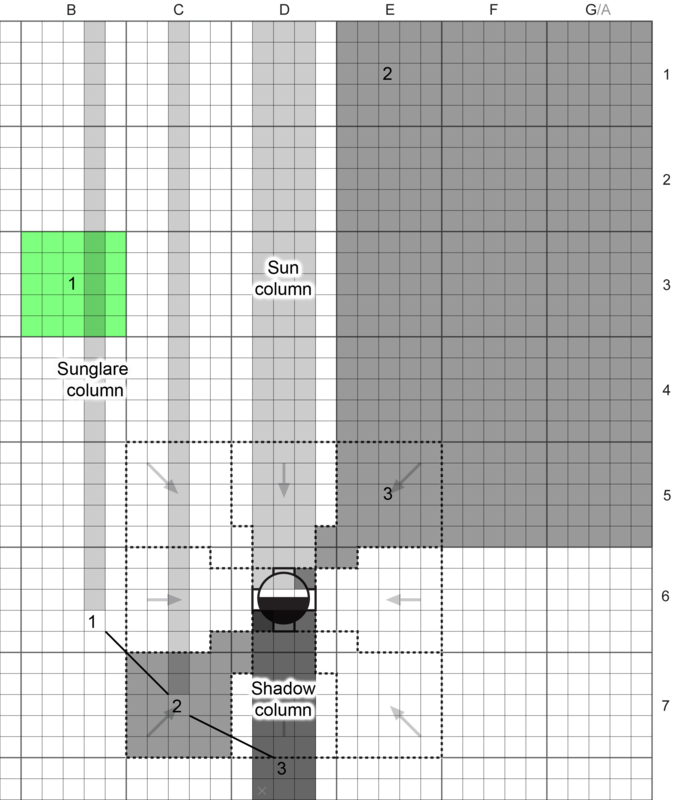 The sun is always shining from the top of the mapsheet as indicated by an arrow. To the left of the arrow there’s a box where you write the actual Sunfactor used in the scenario. The Sunfactor is 6 for Earth & Luna or any planet in the biozone. Each orbit outside of the biozone and the Sunfactor goes down by 1, down to 0 and for each orbit inside the biozone increase the Sunfactor by 1, Mars is 5, Venus 7 and Mercury 8 for example. Sunfactor 9 or above will be hot enough for the ships to require special rules outside of the scope of this little blog post, stay tuned. Sensor scans are done in A/B order and the final Initiative tie breaker is also done inA/B. A/B order means that side A scans first and wins initiative ties on odd turns and B on even turns. There is a row of boxes at the bottom of the mapsheet, cross them off as each turn is performed. The leftmost uncrossed box tell you if it is an A or B turn. Ships with factional thrust (1.33, 0.85 etc) can always thrust the integer part on any turn but the fractional part may give them +1 G to use on certain turns. This is shown on the ship DataCard but the information is also available in the turn number boxes (the 0.25+, 0.75+, 0.5+ values). 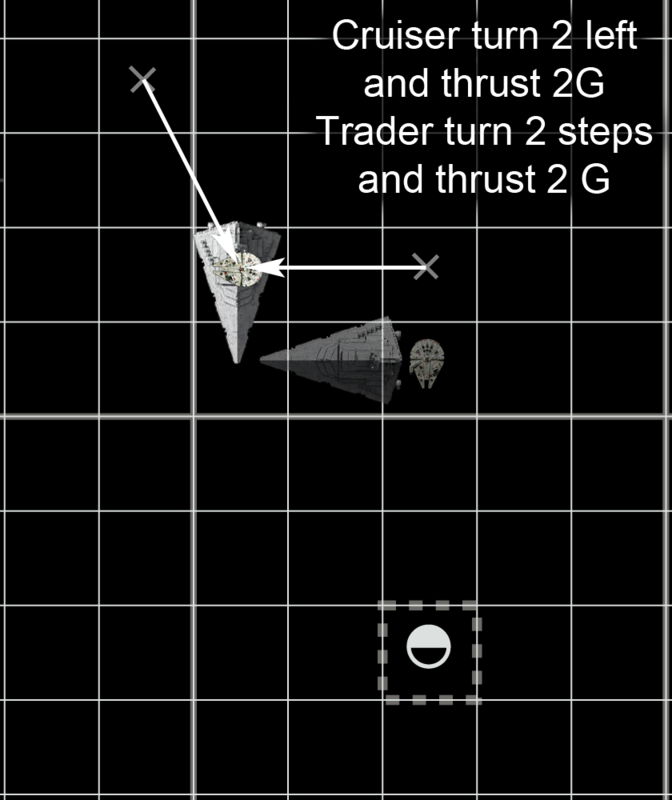 Let’s say your ship has a thrust of 1.33, it will thrust 1 G at every turn but as 0.33 >= 0.25 it will thrust 2 G during the first turn of every four. 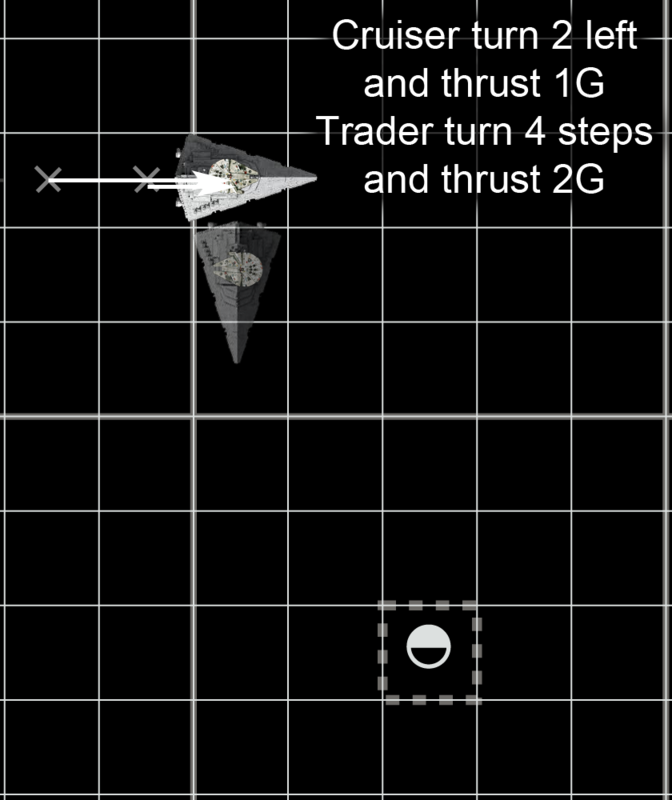 The 0.85 G ship has less than 1 G of thrust so all of its thrust is fractional; 1G at the first, second and third turn but no thrust on the fourth turn of every block of four. That’s all, stay cool, and in the shadows people.